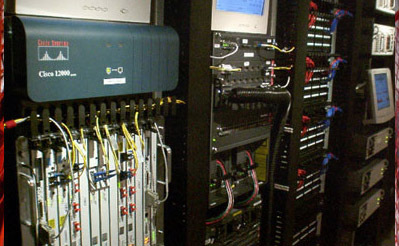 iPadcolo.net is housed in Las Vegas at Switch Communications, one of the most advanced data centers in the world. Their focus on both physical and network security, combined with ready accessibility for our key people made their selection an ideal one. 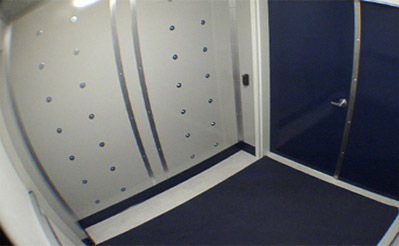 To the right is a shot of the "man trap " where all human traffic passes after a visual test and biometrics. This facility is manned 24 hours a day, 365 days a year by a group of dedicated network engineers. These individuals monitor the condition of the networks, the AC, physical plant, and even the local weather and news; watching for events which could disrupt service. 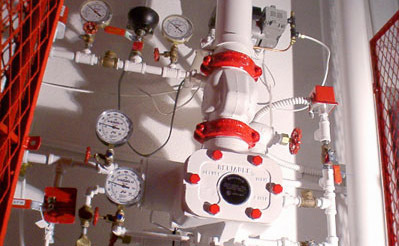 Shown here is part of the controls for the advanced fire suppression system. Keeping your server up and running is what it is all about. In addition to UPS power, the entire center can be powered indefinitely on diesel generators. 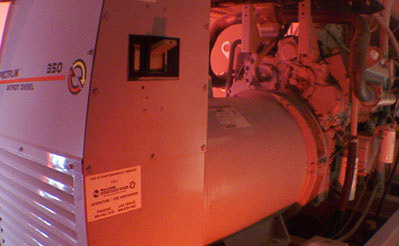 To the right is a photo of one of the generators. All traffic flowing to and from iPadcolo.net passes through any array of cutting edge routers. Multiple independent fiber channels bring the network to the building. Bandwidth is provided by multiple circuits. In fact, no facility in the United States has more in building on-net national backbone connections from seperate tier-1 providers than our facility.